Approximately 20% of the Earth’s plant biomass is in temperate forests. These ecosystems play vital roles on the planet, sustaining high levels of biodiversity and providing important economic and ecosystem services. It’s of great concern, therefore, that these forests face serious threats from human-caused stressors (Millar & Stephenson 2015). How can we assess the adaptive capacity of these ecosystems to deal with these pressures? A key indicator is the extent to which these forests are regenerating today, that is, producing seedlings and saplings that one day will take the place of mature trees as they age and die. Because adult trees are more resilient to environmental change than are smaller ones, healthy-appearing forests aren’t always actually healthy, sustainable ecosystems. Accordingly, it’s critical to assess the vitality of mature trees, as well as the understory layer of juvenile plants. Places with sufficient regeneration today are much more likely to thrive in the future, whereas those with not enough juveniles to replace mature individuals (“regeneration debt”) are less likely to exhibit resilience to human stressors. They used the vast Forest Inventory and Analysis (FIA) database to assess forest regeneration in comparison to mature trees in nearly 30,000 plots across the study area. Maintained by the US Forest Service, FIA is a remarkable inventory of trees and other plant species, big and small, updated with field measurements every few years, across the country. After documenting levels of regeneration debt at localities in their study area, Miller and McGill used other large data sets on deer browsing, invasive plants, land use, and climate change to explore which environmental stressors might explain hotspots of regeneration debt. Future resilience of tree species and forests to human stressors over the next century and beyond is dependent both on the survival of mature trees and on the establishment of new seedlings that will slowly grow to maturity. Some successful forests will continue to thrive in place despite environmental pressures. Others will have to migrate, generally northward or to higher elevations, tracking conditions suitable to their ecological requirements. By definition, success within their current range or at these new sites means sufficient regeneration (Davis & Shaw 2001). This paper provides the first large-scale analysis of regeneration debt as an indicator of future resilience to human stressors. Because the analysis is spatially explicit and not lumped across the study area, it allows an assessment of regional differences in regeneration, as well as a first step at connecting regeneration failure to specific stressors. Miller and McGill found relatively little regeneration debt in the northern region, moderate in the south, and severe regeneration debt in the central mid-Atlantic portion of their study area (Figures 1 & 2). This latter region encompasses the Boston to Washington, D.C. corridor, the most heavily developed and populated part of their study area, where 17% of the US population resides. Low regeneration in this region was associated with invasive plants, deer overabundance, and land use. Disease and suboptimal tree species for the region were also associated with this regeneration debt. 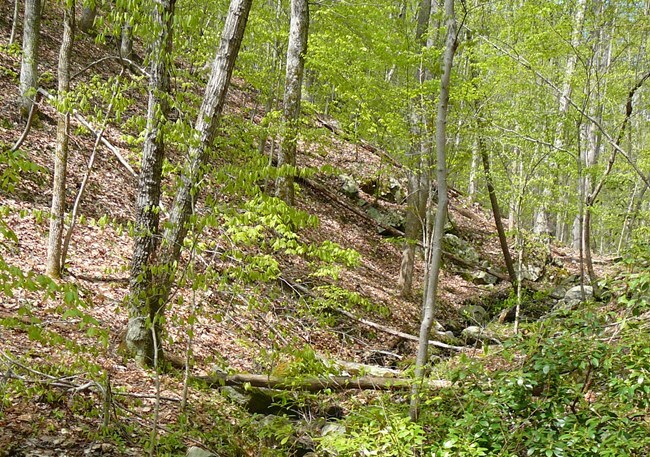 Miller and McGill conclude that “Without management intervention, the severe regeneration debt in the mid-Atlantic region will likely lead to long-term declines in forest cover, with cascading negative effects on forest-dependent taxa and ecosystem services.” They point out further that the impacts of regeneration debt in this region might extend into neighboring areas because these forests might pose a barrier to northward migration of species responding to climate change. This study also highlights the potential for using regeneration debt to assess other forests facing human-caused stressors across the world. Davis, M. B., & Shaw, R. G. (2001). Range shifts and adaptive responses to quaternary climate change. Science, 292, 673–679. https://doi.org/10.1126/science.292.5517.673. Featured Image: U.S. National Park Service. ← The biodiversity emergency: what can we all do?